According to Phil Sacco, when his father started "he was buying and acquiring containers of textile burlap, cotton and other materials. He would recycle and upcycle them." That gave birth to Sierra Recycling, which began as Sierra Iron & Metal in 1958. "It's been a great, great voyage," says Sacco. "Our father brought us into the business at a very young age. I started my first summer in 1969 at the age of nine years old, and became full time in 1979. February of 2019 will be my fortieth year, full time." Since their start, Sierra Recycling has not only found long-term success in recycling both residential and commercial scrap, ELVs, C&D and a wide range of other materials, they have grown to provide industry-specific waste management services to sectors including oil and gas, petrochemical and the agriculture industry. Sacco says his vision from as early as the eighties was to transition the scrap processing side of the business toward more of service company, and specifically, to a demolition waste services company. He says as a successful demolition company, it is really about providing full service. Sierra Recycling goes directly to demolition sites, hauling the needed equipment, including excavators, wheeled and crawler machines, as well as mobile shears, loaders, and then hauls away waste using specialized trailers. About four years ago, Sierra Recycling sold one of their two yards to focus on streamlining operations in Bakersfield. The primary goal was to focus on becoming more of a regional service company through the growth of their demolition and other contract services business, for a range of commercial and industrial clients. Since they streamlined operations, Sacco says he's proud to say business has seen steady growth. Sierra Recycling and Demolition is a proving ground for a wide range of equipment, including this Sierra International Machinery REB-4 baler, used to process a wide range of material, including fibre, plastics and metals. Sierra Recycling and Demolition is associated very closely with Sierra International Machinery, which today manufacturers and globally distributes balers, shear/baler/loggers, material handling equipment and conveyors designed to handle a wide range of recycled materials, including metals, plastics and fibre. Because of this, Phil Sacco says they are often looked upon as a proving ground for various new equipment models and technology the company is introducing to the industry." Sierra has been very, very fortunate to have had great suppliers over many years - definitely in the 40 years that I have been involved," says Sacco. "Our scrapyard in Bakersfield is an ongoing testing and proving ground for equipment from Sierra International Machinery and other manufacturers." Outside of balers and shears from Sierra, he says they have a fleet of roll-off, heavy-haul and articulated trucks, and lowboy trailers. Sierra also employs material handlers, excavators, hydraulic attachments, loaders and forklifts, as well as auto recycling crushers, balers and drainage technology to help safely and efficiently process a steady stream of ELVs. "We depend on Sierra International Machinery for our big, heavy shears, loggers and balers," Sacco says. "We're not just not a showcase for Sierra equipment, we're also a beneficiary of the technology, which has really streamlined our efficiencies." He added that this is where their family's years of experience come into the equation. "It comes down to being very active in the business," he says. "My brother John and others on the Sierra International team that have learned the business from the bottom up, being operators, metal graders and understanding processes, has allowed Sierra International Machinery to fully understand what recyclers, material handlers and the waste industry need for efficient equipment that's going to have longevity." Most recently, Sacco says Sierra International introduced a new generation of two-ram baler called the REB-4. He says this baler "will revolutionize how recyclers can bale and process safely and very efficiently through time, speed and density." REB-4 balers handle a wide range of material, from fibre and plastics, to metals and other items in mixed solid waste. "We're very excited to have this piece of equipment in our yard currently running, and we're helping to make sure it's going to be viable long-term for the industry. After its first several months of operations at Sierra Recycling, it has been very successful, and we're looking forward to a long life with it. "They also run a Sierra 1100 model shear/baler, which has been operating for six years. "It's a fabulous machine that has kept our productivity and efficiency at a low cost and really kept us in the game when our industry took a bad downturn a few years ago," says Sacco. "Coming out of it now, if we didn't have the 1100, we wouldn't be able to produce as much and be as efficient. Still, at its age, our 1100 is producing at a high level. "He adds that in recent years, they have also benefitted from Sierra's integration of on-board electronics to monitor and diagnose their machines. "To have ongoing diagnostics and system analysis while machinery is being operated is an example of the efficiencies that Sierra has really integrated in its manufacturing quality." Safety is the most important aspect of Sierra Recycling’s overall culture as a company. All employees are trained in behaviour-based safety practices and are committed to eliminating incidents at the scrapyard and when working on remote sites. At its core, Sierra has always been a family business. Ben Sacco's primary mantra in building the business was to "tell the customer the truth." This integrity is at the core of what Sierra is all about as a company, and these values were passed down to his sons Philip and John. "This is how you will be treated when you do business with Sierra today," says Phil Sacco. He says he is very proud of Sierra's overall company culture that has been built over the years. He credits the attitude and hard work of their management team all the way down to their employees, from the office to the manufacturing plant, to the scrapyard. "It's a combined culture that has really developed into an interlocked team that cares, and which is very transparent, very accountable," says Sacco. "We are a company that has really improved on standard operating procedures in every aspect of our business." He adds that one of their key business strategies has always been to be customer service orientated. "At Sierra Recycling, we are material handlers. We are demolition contractors. We are scrap metal recyclers and recyclers of paper, fibre and plastics. Therefore, we share the same operating management issues as our customers and face the same ongoing environmental and regulatory challenges. So, the key strategy in this environment is to make sure that everybody is communicating to the customer on changes, potentially on the recycling side, which are ongoing. Similarly, on the equipment side of the business, we have to communicate about the introduction of technology. What are we doing to enable the elimination of wasted efficiencies? "We don't communicate via email," continues Sacco. "We communicate by being in front of customers. It takes time. It's the old-fashioned way where you have to be in front of people. And Sierra's success and strategy is to have a complete network of salespeople and service people, so our customers can lean on that and depend on it. Our commitment is that we're always there for the customer." Sacco is also particularly proud of the fact that Sierra Recycling has gone over 10 years servicing oilfields, hauling away and processing a wide range of waste materials, from structures to equipment and hazardous waste, without any time loss incidents. "We're a company of high cultural values in safety, and I think that passes onto the quality of Sierra's workmanship and how we've stayed focused. This is one of the most key elements, and can be credited to the entire team." He says that in 1988, at a time when both the oil and gas and scrap recycling industries were suffering from a particularly high rate of industrial accidents and deaths, he attended several safety seminars sponsored by local petroleum organizations, and was introduced to behaviour-based safety. Following that, Sierra introduced the concept to all aspects of their business. Sacco describes the key aspect of behaviour-based safety as total human interaction. "The focus is to prevent injuries, and it's an ongoing journey," he says. Once everyone is trained in safety, Sacco continues, management and employees will help each other follow safe practices - it becomes part of the culture.He says their commitment to behaviour-based safety is based on totally eliminating incidents in the workplace. Workers know that everyone is involved, everyone is responsible, and it has paid dividends. "It's separated us from a lot of companies because our great employees and team have adopted the culture over time and have enforced the culture, and they don't want to see it go away," explains Sacco. "Everybody has everybody's back, you might say. It's a wonderful culture of safety. Without it, we couldn't be successful. We couldn't qualify to even work in certain job areas without the safety record we have. It's absolutely the most important aspect of our overall culture as a company." At the entrance to Sierra Recycling and Demolition, Bakersfield, California. 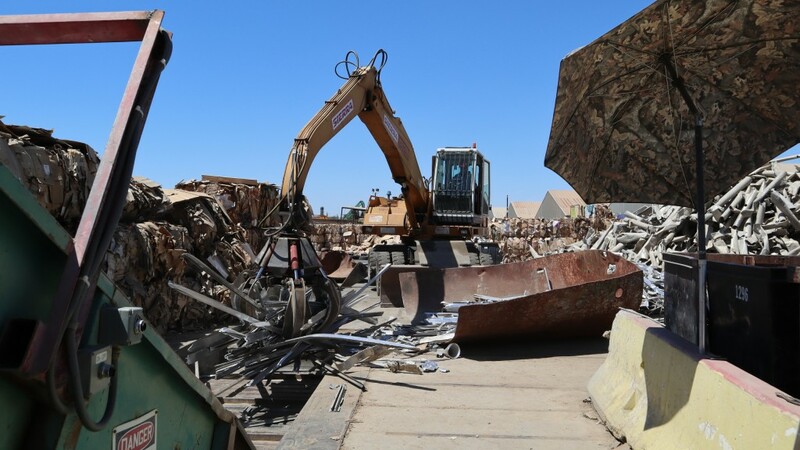 According to Sacco, in the last 10 years, the biggest changes in the scrap recycling industry include the ongoing development of environmental and employment laws, along with changing government regulations. "We have come a long way as an industry," Sacco says. "We have trained our people to reduce exposure to potentially harmful items and all hazards. We have now done everything we can to safeguard ourselves from radiation, we have lead containment, mercury containment, and we can identify hazardous materials in autos and white goods, including refrigerants, carbons, oils or greases, and pesticides and asbestos." Sacco says that probably the biggest-ticket item that has hit scrapyards in the last decade is stormwater runoff compliance. The State of California has a very firm policy on how it's to be implemented, and it's a very costly one. "Liabilities are high in this business, and compliance is one of the biggest challenges as a scrapyard. It is very expensive and it takes a level of expertise to interpret what results could be, and to comply to those results. But, that's the law and we comply to that. It's about ongoing management. And again, we are fortunate because we have built our culture for many years to be environmentally conscious. That's why we've been able to get on board with compliance easily, and we've tried to stay ahead of curve, and worked with our agencies so we're not behind." He adds that because there are naturally occurring radioactive materials around Bakersfield - an oil-producing region - they have been focused on radiation safety in particular, for a very long time. "To protect the employees, to protect clients, and protect the land, you have to protect yourself from gamma and neutron radiation," he says. "The technology in radiation detection has come a long way, in a good way. We have zero tolerance for hazardous material coming onto our site, into our facilities, or being on the jobsite without it being identified by our customer. "Another change Sacco has seen in the last decade or so is with respect to metal theft. He says it is not as significant a problem as it used to be now that the industry is engaged on the issue. "We're fully engaged with our clientele and we have seen a decline in metal theft," he says. "Sierra's standard operating policies just don't invite criminals to come into our facility. We've been very successful as an organization, working with the local law enforcement agencies very closely, on a really interactive level, and have seen declining incidents at Sierra Recycling. He says advances in technology - similar to their effect on compliance and safety - have also greatly helped in deterring metal theft and with their overall efficiencies as an organization. "There has been great technology to help us track incoming scrap that has been introduced over the last 20 years, which is good for law enforcement and our clients," he says. "Our clients depend on our internal audit processes, to have the right paperwork. We have excellent technology in place to validate and verify ownership of material, including how it comes in and how it's paid for." He continues, "Our team has built a system with transparency, backup to catch oversight, and great internal control measures. The team prospers in this kind of environment, and the technology we use in the front office really helps everyone to be an efficient team. The technology provides basically push-button real-time data. We know what goes in to our yard, where it's located, its weight, and how it's classified. And then when it's being processed and inventoried, or put to sale off to market, it is tracked from beginning to the end." This article was originally published in Recycling Product News, Volume 26, Number 6, September, 2018.